Leisure centres on the Western Isles may be forced to open on Sundays under new equality legislation, according to a recent article in The Guardian. This is a perfect example of a clash of worldviews in which the language of rights and fairness is being used to infringe people’s rights and freedom. Leisure centres, golf courses and the like are perfectly at liberty to open and close whenever they choose. 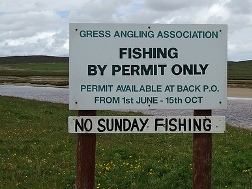 Should the council on the Western Isles decide on a whim that all facilities will be closed on Tuesday afternoons there may be some grumbling and concern at the inconvenience, but no-one will claim it is an infringement of their rights not to be able to go swimming between those particular hours. Why should Sunday closing be any different? The difference is that the Sunday closures are maintained on a principle – and not just that, a religious principle. The Sabbatarians believe that it is good and healthy for a community to set aside one day each week in which the normal hustle and bustle of activity stops and time is taken to relax at home with one’s family and/or to worship God. They came to this belief through Biblical teaching, but have also seen it to be viable, and even beneficial in practice. Yet they have come up against a worldview that is founded on unfettered freedom of the individual. If Sunday afternoon is the time I want to go swimming or to play golf, then I have the right to do that. You can stop me by saying ‘Sorry, we just don’t open then’, but if you say ‘We don’t open then because we consider it wrong to,’ or worse, ‘We consider it bad for you if we do’, then I have every right to take deep umbrage at your audacity. How dare you claim to know what’s right for me, or to impose your vision of human flourishing onto me? One of the dirtiest words in the post-modern West is ‘paternalism’; the worst crime you can commit against humanity is to think you have the answer and to try to impose that answer – however harmlessly – on others. And this is only exacerbated when your answer is informed by your religious faith. There are two ironies here – the first is that the purpose of equality legislation is to protect individuals or groups from being discriminated against on the basis of physical features, sexual orientation or religious belief. To use a law of protection against the very people it is designed to protect makes a mockery of its spirit. The second irony concerns our antipathy towards paternalism. It is widely acknowledged that many of Western society’s social problems are caused by family breakdown and, in particular, by the absenteeism of so many fathers. If the lack of a paternal influence in the family unit can cause so much chaos and distress, why would that not be true at a national level? This isn’t a demand for benevolent dictatorship. Rather, it is a call to acknowledge that authority and experience aren’t inherently bad things. Teenagers reject their parents’ advice because they think things are different now. Cultures should not make the same mistake. This article first appeared on the Theos website. Very well put! It is so often the workers who are paid least who do not have the same benefits as the rest of society enjoys without a thought; the simple enjoyment of their weekends (yes, they may have their days off, but not at the same time as friends and family and probably not two days together…as long as none of their co-workers go off sick, that is). There are so many people working long, unsociable hours just to feed our desire for a consumerist lifestyle. Pay and conditions we would consider beneath us, thankless jobs with no prospect of advancement. I have started trying my best to avoid shopping & leisure pursuits which require other people to be working on Sundays, and also on days when the majority of society get to enjoy their public holidays (like boxing day). This new approach to life is not out of any religious notion but purely out of compassion for fellow humans who deserve rest and relaxation just as much as I do, and probably deserve it even more than I do. Yes, the point about people having days off at the same time as their family and friends is a key thing that often gets missed in the discussions about Sunday trading/working isn’t it? I almost wrote in the post that ideas should be taken on their own merit, not rejected according to who advocates them, but that gets dangerous too – there are lots of things which sound great until you realise the motivation of the person behind them. Perhaps the battle is instead to enable people to understand that Christians (and God) don’t make up these random rules to trap you and ruin your life, but to enable you to flourish and live well. As you and Caren both pointed out, everyone benefits from a day of rest.